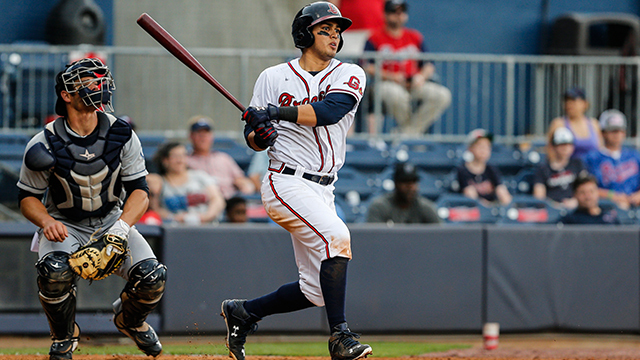 When Rio Ruiz was acquired by the Atlanta Braves in a January 2015 trade that sent the popular Evan Gattis to Houston, the expectations began to pile onto the then-20-year-old third baseman. It had been three seasons since the legendary Chipper Jones retired, and the Braves had yet to find a new star at the hot corner. Ruiz, who had registered 70 doubles, 23 home runs and 140 RBIs over the prior two seasons in the Astros' system, seemed nearly ready for the spotlight and a promotion to the big leagues. But playing for Double-A Mississippi was anything but a rousing success for Ruiz in 2015. He struggled to a .233 batting average over 127 games, hitting only five home runs while setting a career high with 94 strikeouts and making 16 errors at third base. "Last year was an adjustment period for me in pretty much all aspects of the game. New level, new team, new organization, new guys," Ruiz said. The 6-foot, 2-inch kid from Covina, California, batted just .179 (24-for-134) in April and May for the M-Braves before getting hot in June (.310 average) and embarking on a 15-game hitting streak in August. "I think I tried to do too much to impress a lot of people too early in the year instead of just being myself," he said. Heading into the 2016 season, the expectations were a bit lower for Ruiz, understandably after his up-and-down season with Mississippi. But he got off to a scorching start for Triple-A Gwinnett this year, collecting 26 hits in April, the fourth-most in the International League. "I just think that a new year gave me a new opportunity to show what the Braves really found in me and (why they traded for me)," Ruiz said. "It's a clean slate for me now. It was a lot of new things for me last year and this year, I'm a lot more comfortable with the organization and good things happen when you're comfortable and when you're yourself." Ruiz, Atlanta's No. 16 prospect according to MLB.com, has found himself on the lineup card in all but two games through May 16, helping get him more comfortable each day. He said that over the offseason, his focus was on getting better every day and getting back to the way he played in 2013 and 2014 before the trade that brought him to Atlanta along with right-hander Mike Foltynewicz. "I worked really hard this offseason and I continued it in Spring Training and now here in Gwinnett. Luckily things have worked out so far. We all know this game; you have to stay even-keeled and not get frustrated or even too high," he said. The Braves invited Ruiz to Major League Spring Training this year, allowing him to interact with some of the more veteran players and pick their brains to help himself improve. Two players Ruiz singled out - infielders Gordon Beckham and Kelly Johnson - made the biggest impressions on him. "Those guys helped me tremendously in Spring Training," he said. "I would just ask them questions about certain situations about playing the field and hitting of course, but I really wanted to learn what their mindset was when they're on the field. They're professionals and have been in the big leagues a long time. I wanted to do as much as I could with them and get as much out of it as possible. In that aspect, it was a success for me." It's in the field where Ruiz's growth has taken the biggest leap in 2016. He posted a fielding percentage of .950 or lower in three straight seasons, committing 52 errors over that span, but by taking ground balls every day and devoting himself to the defensive side of the game, he's made just three errors in 85 chances (.965 fielding percentage) through May 16 this year. "My high school coach told me 'hitting is going to get you there, but defense is going to keep you there.' That really stuck with me and of course everybody that gets to the big leagues wants to stay there, so I feel if I follow the game plan that I have as far as working and taking ground balls every day, everything should take care of itself," Ruiz said. The extra work needed to be successful with the glove is reminiscent of the time Ruiz had to put in at Bishop Amat Memorial High School (La Puente, CA) where he starred as a two-sport athlete, both on the diamond and on the gridiron. Ruiz verbally committed to play quarterback at the University of Southern California as a freshman in high school and went on to throw for 3,364 yards, 33 touchdowns and a 63 percent completion rate over three years. But when Houston drafted him in the fourth round of the 2012 June draft, Ruiz traded the pigskin for a bat full-time. He batted .433 with 138 hits and 102 RBIs in 104 games at Bishop Amat, helping make the decision a little bit easier. His experience in conquering a position as physically and mentally demanding as quarterback has helped Ruiz become a better athlete now that he's a professional baseball player, even though his days on a football field are long gone. "Some things translate from playing quarterback and now being a third baseman, but that was four, five years ago," he said. "I don't do the same things that I did in high school and when I played football. I work specifically now on just baseball-related workouts and working on baseball-centric quickness, but I'm sure a lot of it helps, having that experience." Rarely seen without a smile on his face, Ruiz stressed that his experience in Gwinnett to begin the 2016 campaign has been one of his favorites to date, helping keep his mind off the potential next step in his career. "Ultimately it's the front office's decision about whether or not to call someone up and decide if he's ready or not. My job is to enjoy the time I have here in Gwinnett and not worry about what is ahead of me," he said. "I can't say this enough: the group of guys we have here is awesome. I thoroughly enjoy coming to the park every day, knowing the group we have here is great. I don't put too much pressure on myself at all. Everything will take care of itself if you play the game the right way." After being named Gwinnett's April Player of the Month by Atlanta, Ruiz cooled a bit in early May, batting .200 through his first 14 games. But he remains confident in his abilities while seeing some of his power come back with nine extra-base hits - including two triples and a pair of home runs. "All it is really, is getting a good pitch to hit and not missing it," Ruiz said. "I'm already checking some goals off this season. I'm happy with where I am now, nothing is going to bother me. Every day is a new opportunity to get better and it's a new chance to make my way towards the big leagues."